This new Business English course takes beginners and false beginners from basic English up to the point where they can start preparing for the BEC Preliminary examination. Business Start-up brings reality to the most basic levels of language learning through the use of authentic material, real companies and credible communication scenarios, ensuring that adult learners remain interested and motivated. Communication skills are carefully prioritized, allowing learners to start working in English at the earliest opportunity. To complement the professional English syllabus, the final lesson in each unit deals with a 'Time Out' topic, focusing on essential language for travel and socializing, allowing learners to build important general vocabulary. 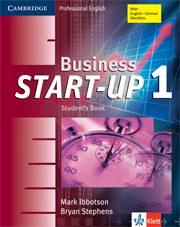 The Business Start-up Workbooks provide self-study practice of the language from the Student's Books. In addition, the Workbooks come with a free CD-ROM/Audio CD containing extra grammar, listening and vocabulary practice. This version is available in German-speaking markets only. 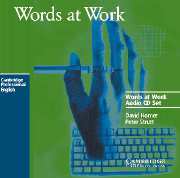 Words at Work offers vocabulary development for learners who want to use English more effectively at work.